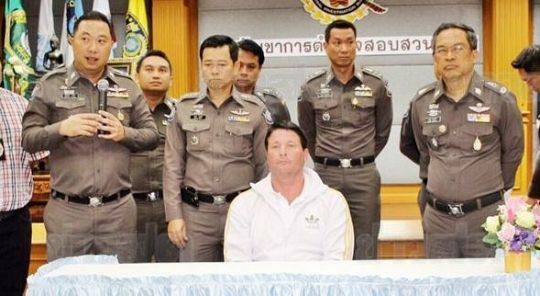 American fugitive Theodore Andrew Werner, 48, wanted by New York state police for internet fraud, was arrested quietly in Phuket on Saturday (July 18). Werner was presented to the press at a conference at the Central Investigation Bureau in Bangkok today (July 20) following his arrest at a condominium in Patong, reports the Bangkok Post. CIB deputy chief Charn Wimolsri said the arrest came after a US law-enforcement unit in Thailand asked the CIB to locate Mr Werner, who had been hiding in the kingdom, and deport him to the US. Mr Werner is alleged to have impersonated a New York Department of Taxation and Finance official and made fraudulent internet calls to lure people into investing in businesses and transferring money to him. Werner is estimated to have defrauded victims of more than US$2 million (B68.8 million). Pol Maj Gen Charn said investigators found that Mr Werner arrived in Thailand last year on a tourist visa, then obtained a student visa to prolong his stay. He previously stayed in different rented rooms and apartments with a Thai woman in Nakhon Sri Thammarat before police located him in Phuket. Werner will be sent back to Phuket, where the Phuket Immigration Office will process charges in order for him to be deported, Gen Charn added.